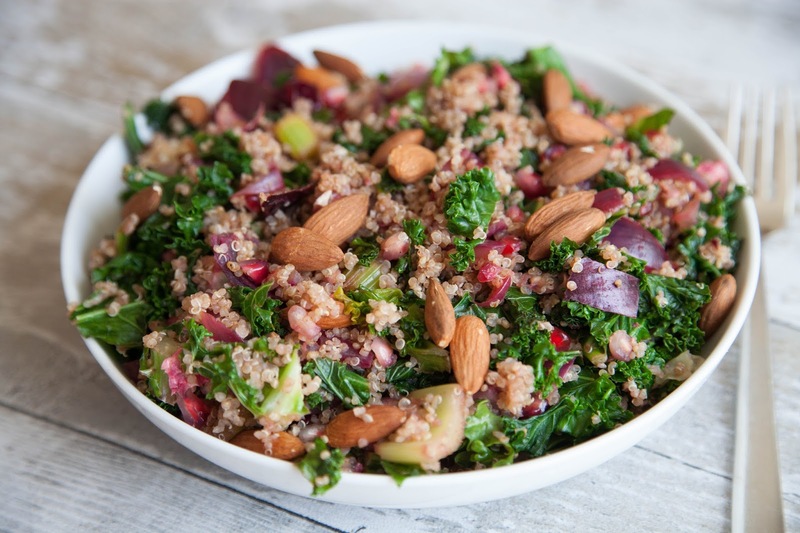 Jewelled with sweet yet sharp pomegranate seed and crunchy almonds on a base of wilted kale and quinoa this is a great BBQ accompaniment or a dish you can make a batch of to enjoy for lunch throughout the week. – Cook 1 cup quinoa according to packet instruction and put to one side. -In a wok or large pan heat olive oil over a medium heat, add the garlic, sliced onion and celery and cook for 3-5 mins until they begin to soften. -Slowly begin to add the kale to the pan until it begins to wilt slightly. -Remove the wok or pan from the heat and stir in 2 tablespoons of Tamari before adding the pomegranate seeds and almonds. -Pour into a serving dish and enjoy.